This has been a challenging design to put together but clients are now happy with it….! We will now make a pre-application approach to the local planners and conservation officer to test the water. Once we get their preliminary feedback, we can then assess the impact of our proposals and tailor the application to match…. 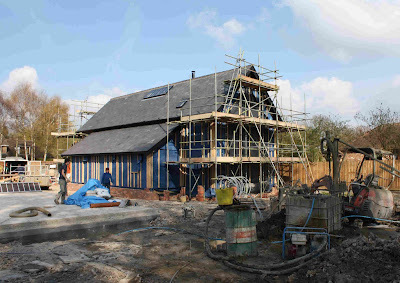 This is my next door neighbours project……. closest site visit ever on this one! 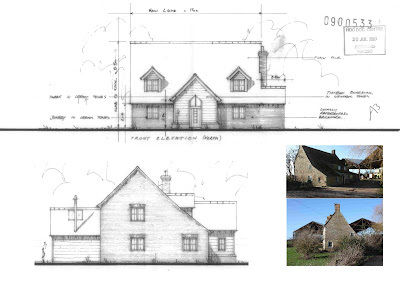 We got planning passed last year for the replacement of the original farmhouse where him and his brother were born!.. 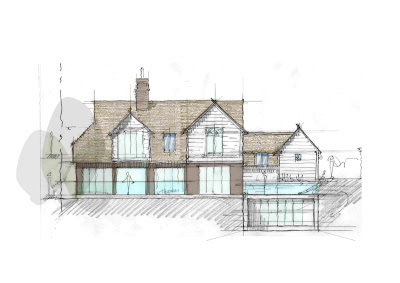 This is the site for 2 we designed and got planning for in Cambridgeshire. Its in a really great little village in between Royston and Cambridge…. 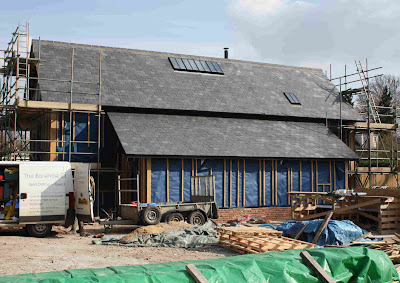 The client is doing a fantastic job all round and at the moment, we believe the project is on schedule and there or thereabouts in terms of budget! Its an Oakwrights frame clad in their award winning LightWall encapsulation system providing the highest levels of insulation and is breathing wall technology at its best. More pictures will follow as the site progresses…. I have linked up with http://www.vectorfunk.co.uk/ who will be hosting my work and we have many single and joint collaborations lined up for the year as well as showcasing emerging artists. 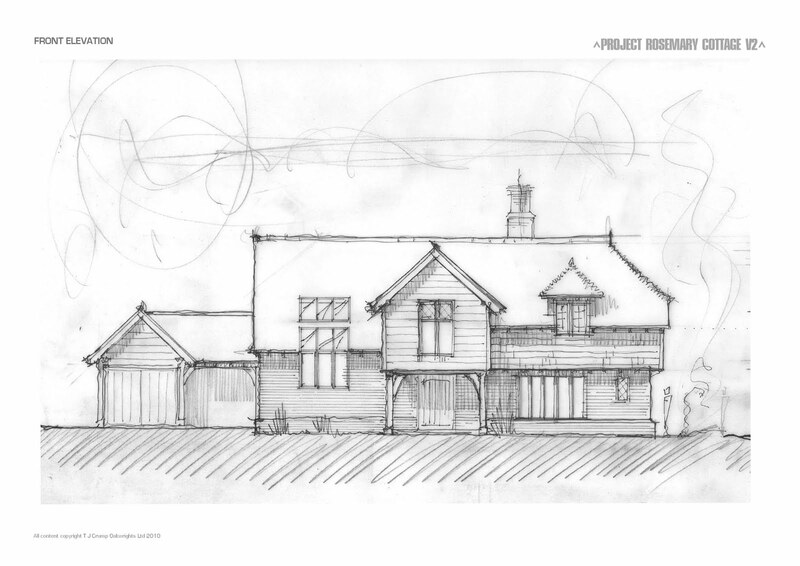 PJT DESIGN NOW ON FACEBOOK…..
Its a replacement dwelling project in Green Belt and AONB and we are attempting to get a 2 storey building out of what is currently single storey. A few challenges ahead but will keep you posted….! The project involves the demolition of an old barn near to an ancient burial chamber so something new to investigate and get my head around! 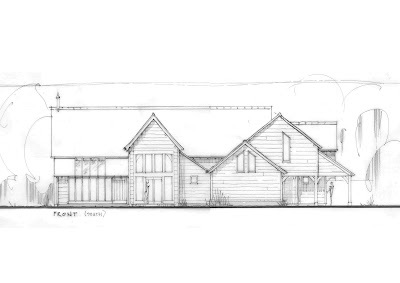 We are intending to replace the barn with a near replica of the old design but have added in contemporary touches such as glass balconies, curved mezzanine floors etc…. Full planning drawings will be posted up soon. 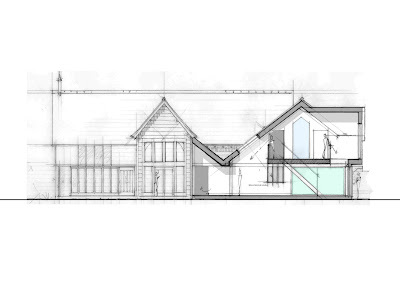 This is a really interesting site down in East Sussex we have been designing a replacement dwelling for. It has got loads of challenges such as a steep sloping site and many trees but it also has the most amazing views across open countryside so will be worth all the effort! I have gone for classic Arts and Crafts Sussex style combining correctly proportioned building geometry, correct fenestration patterns and locally referenced materials such as soft red peg tiles, soft red bricks and white deep section timber boarding. 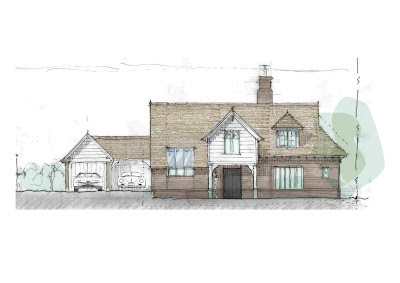 I think its a great looking house so just need to convince the planners now…. will keep you posted.